Well that flew by! I said it last week, but for such a little space and relatively short to do list it was a challenge to get everything done. And actually, it didn’t all get done. 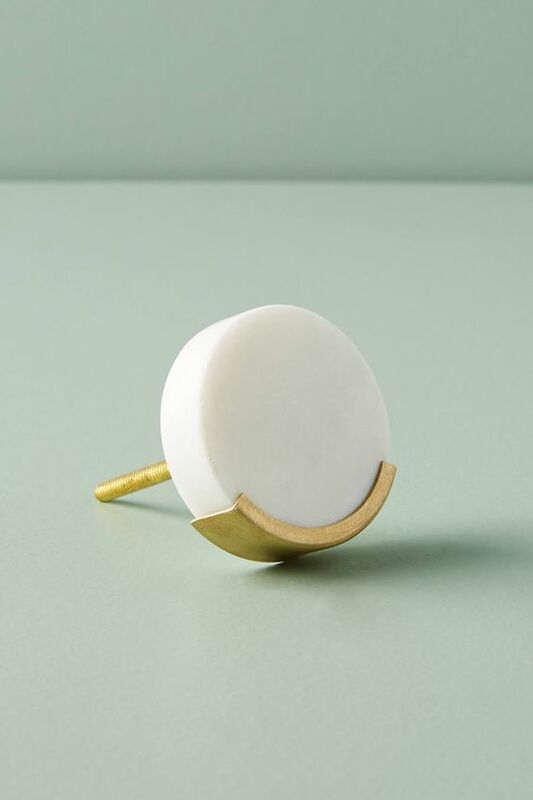 The towel ring is still on back order and didn’t arrive and really will complete the look when it comes. Overall, I’m really happy with the improvements! I’m considering this a stage 1 quick redo until a more major overall that down the road a few years that would include tile up the walls, wall papering up the rest of the 16 foot ceiling, new sink mirror and toilet, etc. For a few hundred bucks though, I’m considering this a great success. Thanks to the One Room Challenge organizers for the motivation to get something around here finished- for now. Enjoy the photos (this is the first time I decided to just take them myself from my phone…that’s how we’re rolling lately). If you have any sourcing questions, feel free to reach out through email or Instagram! Also, I realized I didn’t take any before photos!! Just imagine a completely empty room with 16 foot ceilings and white plastic fixtures :). To see all the other guest participants final reveals, click here! Week 5 already! And not much to report- the light fixture and toilet paper holder came…but the towel ring is on backorder and supposed to come on Thursday. Hopefully. For such a little room, it’s actually been quite challenging to finish in 6 weeks. We’ll see if I can pull it off! To see the other guest participants week 5 progress, click here. Check out the other guest participants’ week 4 progress here. See you next week! The navy cabinet I’ve been waiting for finally came and it is gorgeous!! The fretwork adds some much needed texture to a lot of blank wall. I hung the Christie Adelle art above the cabinet and my husband helped me hang the shelves above the toilet (and I started playing around with accessorizing a little bit). It’s starting to look so much better in there! To see all the other guest participants’ week 3 updates, click here! Kind of a quiet week around these parts, but lots should be happening this coming week. Perfect timing to showcase the rug a little bit! I got it from a company called Zuma Imports. I’m so glad to know about them! 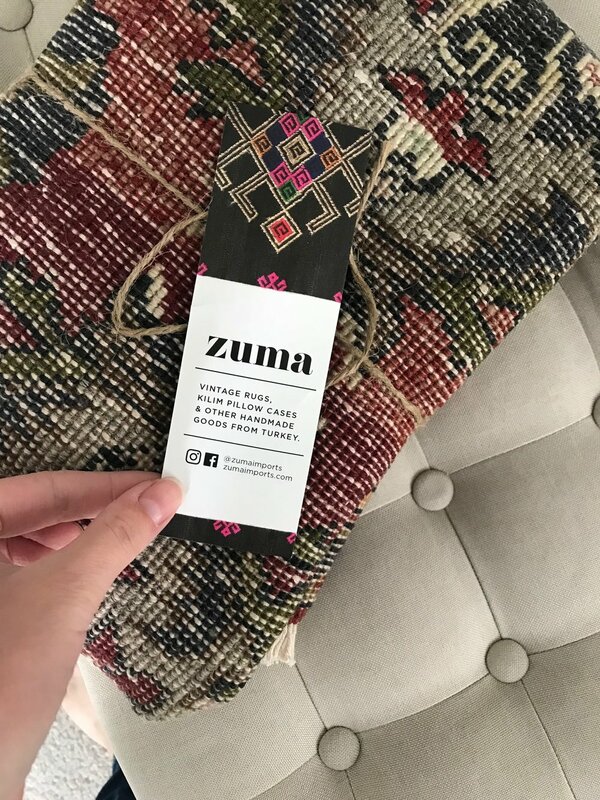 They were so nice and have a whole section of small vintage rugs (which can be so hard to find). The rug I bought has navy, olive, gray, cream and some beautiful salmony pink that fades into red. Aaannnnd the first of my boys to pee on it, is in serious trouble. Click here to see the other guest participants’ week 2! It’s that time again (time for another round of the One Room Challenge to motivate me into finishing something!). But! This time is much different for me. I’ve watched participants for years, participated myself last Spring in our rental, and this time I get to do a room in my own home! After rental hopping here in Utah for 5 years and moving around the country for school/training for 10 years before that, we bought a house!! I have grand plans for renovations down the road, so for now a lot of space need a smaller phase 1 refresh before a more major phase 2 overhaul. The powder bath off our entry is the perfect example of this. It’s pretty much blank slate with nineties finishes and a very tall ceiling. Someday new flooring, fixtures, tile up the walls, a beautiful paper above the tile and on the ceiling, etc., etc. will be amazing…for now, phase 1. Ha! We currently don’t have any storage in there at all, so that’s our number 1 programming need- a small cabinet for toilet paper, soap, hand towels and all the things that have been collecting in piles since we moved in! I have some art I had framed in one of our rentals but hadn’t hung, as well as some shelves that I’m really excited to finally use. And the most beautiful rug ever. More on that next week. Let's take things back to the beginning shall we? Yikes. Not too pretty! Crazy what I was complacently okay living with when this little room held so much potential! Why do we do that?! I am so pleased with the results, period. But especially when considering factors like the size constraints, the unique shape of the space, time frame, a small budget, it being a rental space, and some personal challenges...I'm just really happy. It never gets old seeing something created in your mind's eye take shape and then even exceed your expectations. Man, this is a fun business! I wanted my office to be a celebration of natural textures, to be pretty yet fun while still being relaxing, with a nod towards feeling coastal without being too thematic. 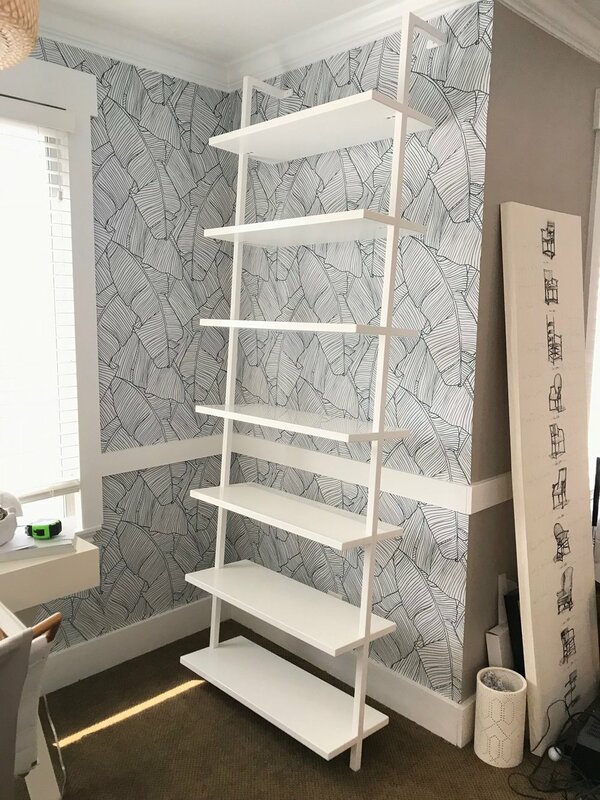 The removable wallpaper from Walls Need Love was my jumping off point and from there incorporated the leather weaving in the chair, the bamboo light fixture, the marble cabinet hardware, and the rattan and wire baskets for my sample library. This library shelf from Cb2 was love at first site. Sleek, low profile, and perfectly functional for holding my sample library and staging books and accessories. I kept most of the office pretty monochromatic so I could really have some fun with color here. This architectural history poster from Popchart Lab was a no brainer and these chair hooks- come on! 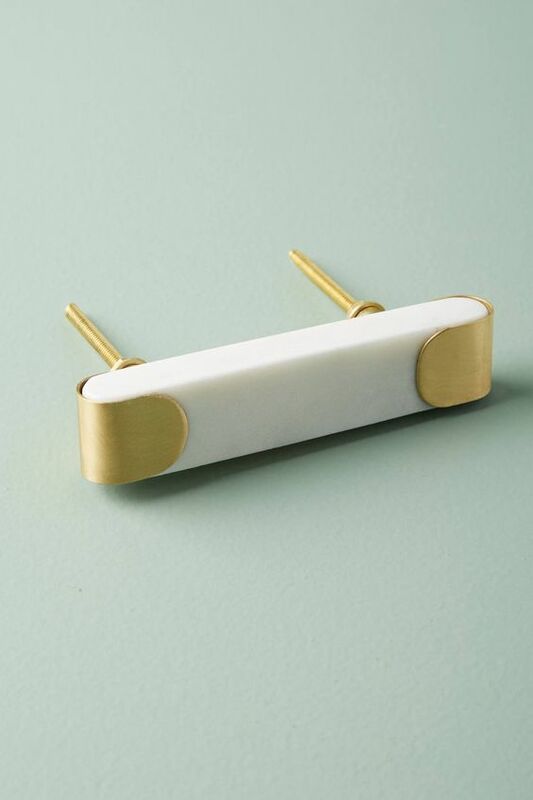 So perfect (they are from Ikea and I spray painted them gold). No matter how I choose to organize my open design projects I still love to have a visual list of client to dos and this gold white board is so fun and glam. And the cabinet I painted has a fun history- I bought it on a farm in Minnesota right after we moved there in 2010 and it started out as hutch that I painted black- now it's lighter in two ways! Thank you for following along! It's been an incredibly fun 6 six weeks. 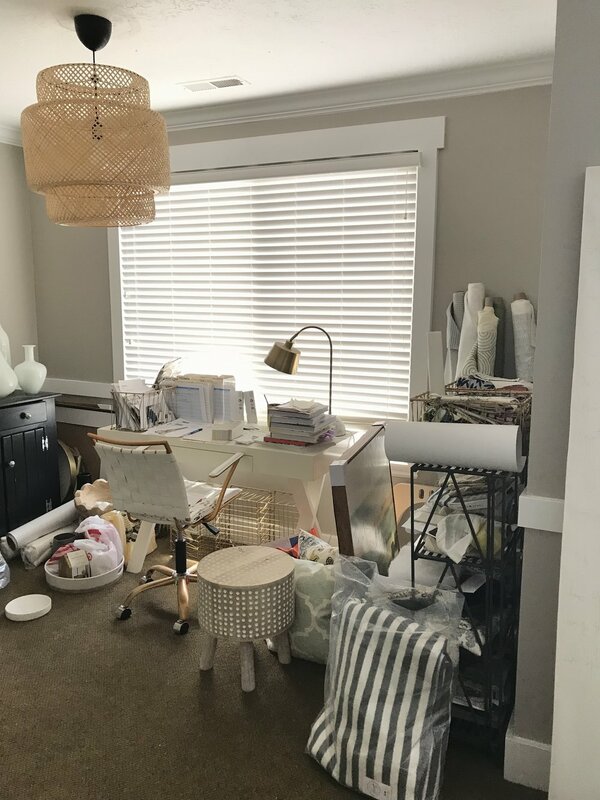 Thank you to Linda at Calling it Home and The One Room Challenge and to House Beautiful for such a great opportunity and event. Hopefully you've had a chance to check out the featured designers reveals already. For all the other guest participants' reveals, click here, Who knows? Maybe I'll see you back here in the fall! ORC Week 5 "Done is better than perfect"
Next week is the full reveal! Wednesday will be the all the featured designers' reveals and Thursday will be all the guest participants. To check out their progress and race to the finish line click here. See you back here next week! Here we are at week 4....already! Time flies when you have a deadline! I don't have any pretty pictures this week, but that means the dirty work is getting done. My biggest (ORC) accomplishments this week were putting together the shelf and painting the cabinet (I actually still have one coat to go but should finish today). 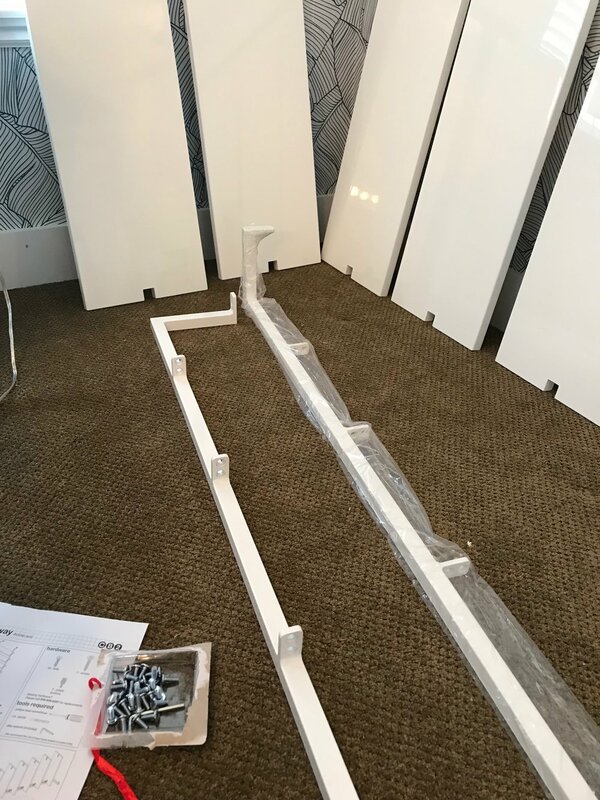 When I ordered the shelf, I purchased the 8' because even though my ceilings are 8', that was the best size option for the look I wanted...I just needed to figure out a way to cut down each metal shelf pole to account for ceiling height and crown molding. This week I had a nice neighbor with all the tools cut 5 1/2" off each side for me and now it's the perfect height! The bottom shelf is pretty close to the ground, but I'm totally happy with how the final result looks. This is after the first coat of paint on the cabinet. 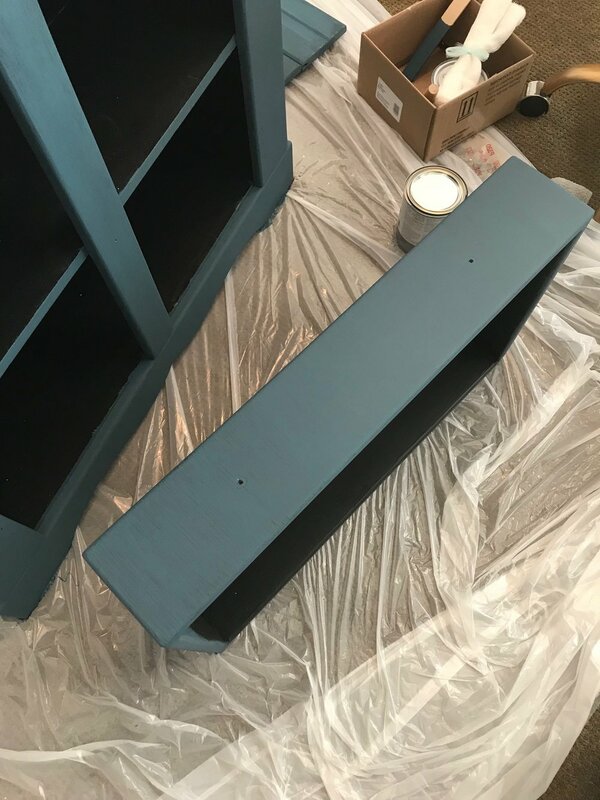 I decided on chalk paint to avoid having to sand and prime it, definitely a time saver....but the color choices are limited. 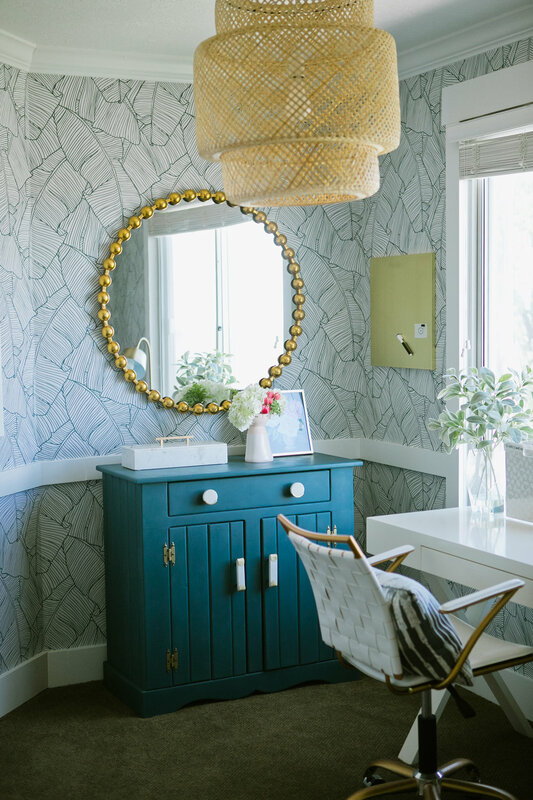 This color was the best option- it's a little greener than I'd like- but still looks great with the wallpaper, which is actually a blue/green/gray but comes off more navy in photos. Besides finishing the cabinet, this week I will fix up the light a bit and hide the ceiling with a medallion. I have one more little DIY to attempt (a bulletin board) and then the styling can begin! Click here to check out all the other guest participants' progress. This week (even with my late start a sick little boy) was all about wallpaper! It's not completely done, but I feel good about my progress! I will say that I've worked with removable wallpaper quite a bit lately on some other projects and this by far has been the hardest pattern to match up as I add new panels. I think it must be because the pattern is so detailed and also the repeat is so large. It's happening slowly but surely...between working on school projects and my bedtime, between doctors appointments and school pickups, and during those naptimes that seem to fly by! I'm hoping to finish the papering tomorrow. and you just peel the backing off and go to town! It can be peeled back off and repositioned as many times as you need. I'm always on the look out for great products for clients and I found this mirror locally this week for a steal!! If I'm going to store it until I find the right permanent home for it, it might as well live on this wall looking perfect, right? This week (besides finishing the paper, I'd like to paint the black cabinet and finalize any ordering! Don't forget to check out all the other guest participants in week 2! 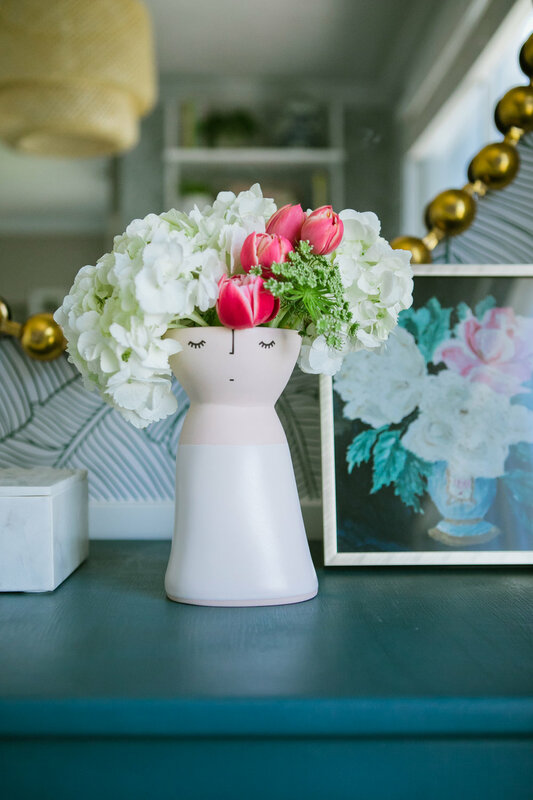 After loving Calling It Home's One Room Challenge for years and feeling so inspired each season (by the featured designers and so many guest participants! ), I finally decided to join it. I'm super excited to participate and help cheer on so many others in finishing a room in six weeks! I have never jumped in before because I'm not a blogger and until VERY recently did not have a blog. Starting a blog in 2018 kind of feels like I started running a marathon...without any training or conditioning, and when everyone else has already been running for 20 miles or so...so here goes nothing- ha! Seriously, I have no idea what I'm doing blogging wise and don't plan on blogging outside of the ORC, but creating it for this was worth it because I have the perfect space ready and waiting. In fact, it's been ready and waiting for about a year- as in I've had 95% of the items/decisions made that whole time but then life is busy and hard and great and you blink a few times and you've lived in your rental a year and half and may only be living in it a few more months and it's now or never, you know? So here it is. My office (I'm realizing it wasn't ever really discussed between my husband and me that it would be an office and that it would be mine, but it's definitely been my office in my mind since before we moved in). It's a little space off our master bedroom (sort of between the bedroom and bathroom). 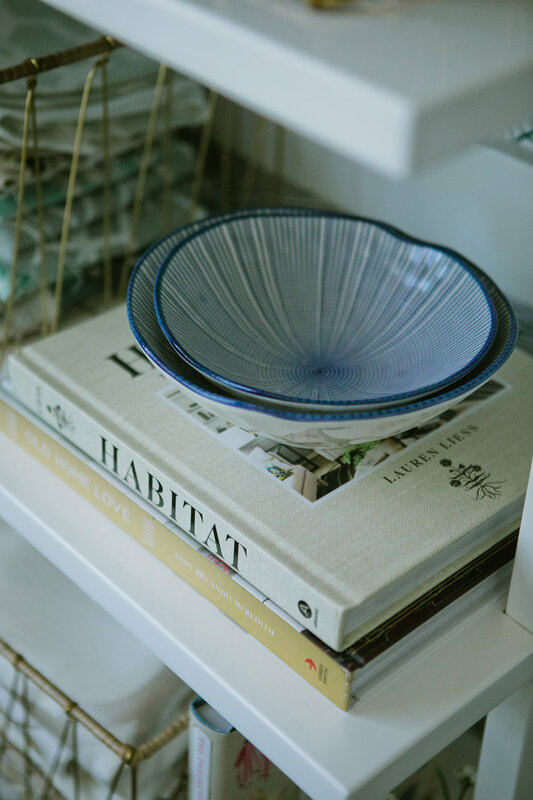 This week I'm sharing my mood board, the floor plan, and a couple scary before photos. My goals for the space are to have a better system (with more shelving) for my sample library and small accessories, some sort of bulletin board for current client projects and inspiration, and just an overall more organized and uncluttered space to work. I picture me sitting at my desk, showered and completely ready for the day, sunlight streaming in, working hard and feeling inspired (since that's how I always work and receive my inspiration for projects, never at 1:00 in the morning with a pony tail and tired eyes). My to do list doesn't seem too bad (but then why has this stuff been hanging out in there for year?? A little accountability goes a long way for me). I think the biggest leap forward will be the wall paper so that's my goal for this coming week. It's a temporary paper (renter friendly) from Walls Need Love and I can't wait to see it up! Here are this ORC season's amazing Featured Designers and here is the list of fellow Guest Participants. See you next week!